Today began with Professors Silverman and Hinds sending us on a mission. They told us to find The Secret Book Store. We were pointed towards the street that the store was off of and then they left us. At first I thought that it would take us awhile to find it. However, I kept my eyes peeled and we found it rather quickly. It was an interesting task to be assigned. So far during this trip we’ve been led through the city by our professors. We haven’t had to find something completely on our own. Doing this was interesting because it made me think a lot about what it would be like to be a tourist here instead of a student. Later as we walked around the city, we found St. Audoen’s Church. 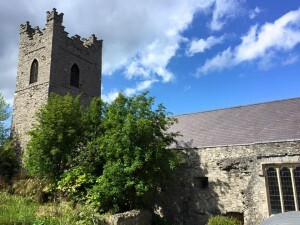 It is the oldest church in Dublin and was built somewhere between 1181 and 1212. It was free to go inside so we decided that it would be cool to look around. As we were looking at the old stone walls and crypts, Professor Silverman commented on how interesting it was that we were in such an old historic place after being in a “hipster café” for lunch only a few hours earlier. I felt grateful that we’ve come so far that we can enjoy the modern amenities like cafés but still have such wonderfully preserved places that can allow us to look back and see how far we’ve come.